If there’s anything you need to know about tater tots to understand why their modern ubiquity is so crucially needed and deserved in these uncertain times, it’s this: they were invented by a high school dropout in the 1950s who had to resort to bribery to get them into circulation. Tater tots are cheap and bad for you. I grew up eating them in a trailer park alongside other trash food like Vienna Sausages and Velveeta cheese. Tots are beloved by children, stoners, drunks, all poor people, Unabomber Ted Kaczynski, and lovable losers like Napoleon Dynamite, who ate them out of his pocket, where he’d kept them in case he needed a snack. In the 1950s, Nephi Grigg and his brother Golden were farmers in Idaho who sold corn and potatoes, according to a history at CNN. When they had a chance to buy a bankrupt flash-freezing plant, they mortgaged their homes to do so. They named the new company Ore-Ida because of its location to the Oregon border, where their foray into frozen corn was a great success. But it was the frozen French fries market, suddenly booming alongside Americans’ love of frozen foods, that they wanted a piece of. Taking potatoes to frozen French fries was easy, but what troubled Nephi were the leftover scraps from the potatoes they could only sell for change as livestock feed. Nephi’s Depression survival skills meant he believed there had to be more profit in the trash scraps, so he experimented and made the ultimate junk food: ground potato scraps, spiced and extruded, then fried up. He called them Tater Tots, and hauled 15 pounds of them to a fancy hotel in Miami for the 1954 National Potato Convention. To get them on the plates of the people who mattered, he bribed the convention’s head chef. They were an immediate hit and appeared in grocery stores a year later. Soon home chefs would decide to bake them into perfect crispiness, but their instant adoption into suburban homes and cafeterias — Tater tots are tots, just as Kleenex is tissue paper — cemented their permanence as a comfort food for the masses. Then came the hipsters and foodies, who drew on the food’s childhood nostalgia and high adaptability as a starch, and elevated them them from low to gourmet. Bon Appetit gave the kid food a high-end makeover in 2011, using quinoa flakes and flaxseeds. Once the stuff of the Sonic drive-thru and diners, tater tots suddenly started showing up on the menus of legit restaurants, and began to be elevated with whole grain mustard, sriracha, ranch or barbecue sauce as condiments, or topped with mac and cheese, foie gras, gorgonzola, or homemade chili. Forbes recently advised that you can pair them perfectly with champagne, but it’s important to note that they’ve never lost sight of their roots. You can still use them in recipes like this White Trash Casserole, which layers diced ham, broccoli, Velveeta cheese and cream of mushroom soup over the tots. That’s the thing about the best trash food: It can go high or low, while never forfeiting its credibility as either. You can still drive through a Sonic and order them with cheese and chili, or eat an elevated chewy bacon cheddar tot served with sriracha ketchup that’s divine at a trendy Los Angeles “pub,” and with no loss of honor. 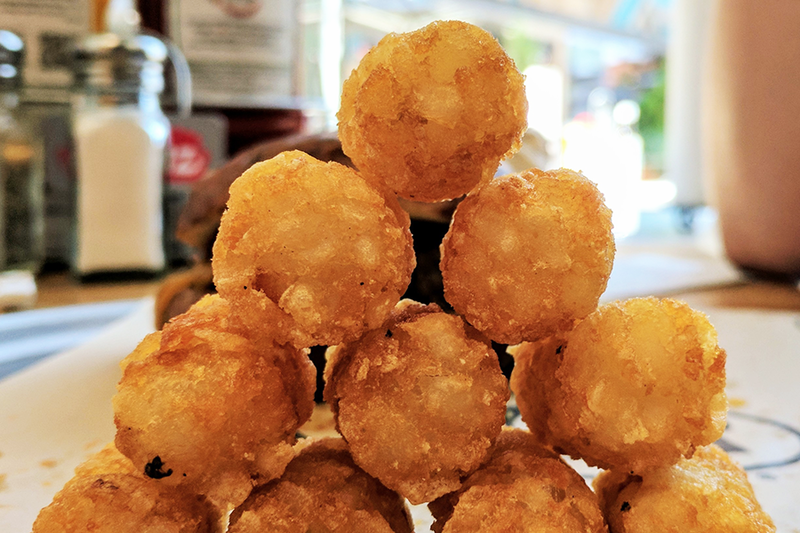 But perhaps more important that the history of tots, or their various adaptations, is the fact that the tots’ continued existence and beloved status is a kind of great equalizer for the masses, providing us cheap, stomach-warming sustenance in these dark, terrible times. It has always been there for us, an available and affordably delicious treat for all people, and may it always be so, for all of time.